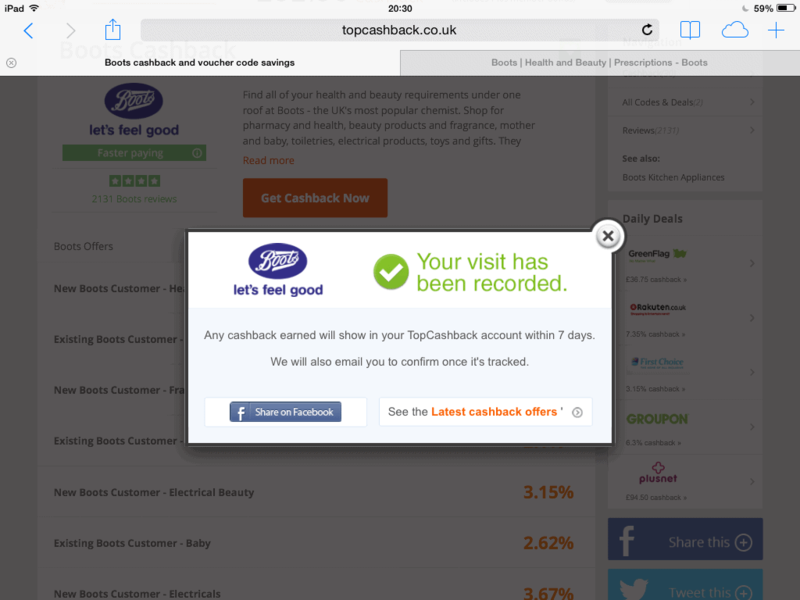 Have You Discovered TopCashback? It Gives You FREE Money. Seriously. I want to share my favourite money-saving website, as it actually gives you free money. If you haven’t discovered topcashback.co.uk yet, do check it out. I have made over £1500 over the past five years, just by clicking through it when shopping on line. I’ve told a lot of my friends about it, but for some reason most of them glaze over when I try to explain it, and think it’s too complicated to bother with. Trust me, it isn’t. This is FREE MONEY, just from a few extra clicks. I know it sounds too good to be true, but it really is brilliant. How Do You Get Free Money From topcashback.com? Now, I must stress that the cashback does not work every time, so please shop around for the lowest price, and then go through this site. That way, you’re not out of pocket in case your transaction doesn’t track for one reason or another. I think of it as a nice bonus when it works. The other thing is it can take weeks, or even months to get paid. So it’s not a quick one. Most of the shops I use are on here, apart from John Lewis. So when I bought my pushchair from Boots, I got cashback. When we needed house insurance, I got cashback. New credit card? Cashback. Rode side assistance? Cashback. New shoes? Cashback. Christmas shopping? You guessed it! Most offer a small percentage of your purchase, but some, like insurance or something like a Sky or broadband contract offer a bigger payment. This is what the site looks like when you find the company you want to shop with. I’ve picked Boots as it has lots of different levels of cash back, but don’t worry, they work that out for you! Now you just have to wait for your free money to be ‘payable’, when you can ask for a payout. You can get cash paid straight into your account through BACS, but I’m a bit cautious of putting my account numbers in and opt for vouchers. You can get all sorts, including Amazon, Argos, Boots, and loads of others. It takes a few days for this to be processed, then you get an email saying your pay out is ready and you can go to your account and redeem your voucher. It’s free to join, and you can often use discount codes too, though sometimes they stop the cashback from tracking – I always try, as I’d rather have a discount straight away. Please be aware that if you click thorough the links at the top of this page and join up, I might get a referral bonus. I’d you’d rather just go to the site without going by my referral link, just click here. I’m not writing about this this to get a reward, I just really want to spread the word! I hope you like it as much as I do.